Collins Booksellers - Coral Reef Marine Plants of Hainan Island by Titlyanov, Antoninovich Eduard, 9780128119648. Buy this book online. Coral Reef Marine Plants of Hainan Island summarizes the literature on the role and use of marine plants in coral reef ecosystems, especially in China and countries in the Asia-Pacific Region. 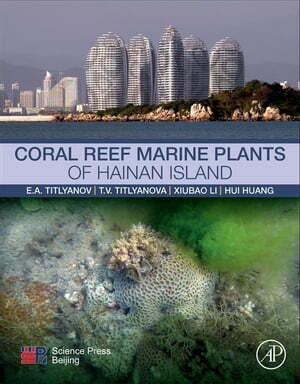 The first chapter of the book focuses on the description of coral reef ecosystems, their architecture, and status of Hainan coral reefs. The second chapter focuses on common knowledge surrounding marine plants, such as their classification, identifying characteristics of different phyla, morphology, reproduction, life forms, main algal communities on coral reefs, distribution of algae on coral reefs and their roles, and the use of seaweeds in cookery, medicine, industry, and agriculture. The third chapter on the seaweed flora of Hainan Island contains species composition of the marine benthic flora, the complete list of marine plants found by researchers from all studies, and historical changes in the flora and seasonal changes. The final chapter shows how to identify common species of marine plants on coral reefs of Hainan Island. This excellent work will help readers identify relevant plants, also teaching them how to use plant resources to assess endangered states and create conservation strategies.